You damn’d old Scoundrel if you don’t sign the pardon of your fellow men now under sentence of Death, De Ruiz and De Soto, I will cut your throat whilst you are sleeping. I wrote to you repeated Cautions so look out or damn you. I’ll have you burnt at the Stake in the City of Washington. 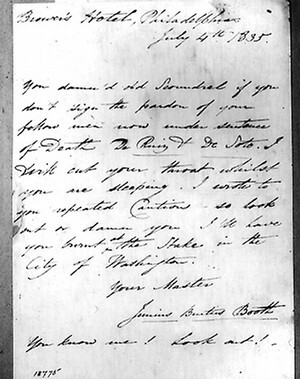 Your Master, Junius Brutus Booth. You know me! Look out! John C. Fremont led a life of considerable achievement and seemed to many of his contemporaries a man of destiny. However, in the Civil War his destiny eluded him. An engineering officer in the US Army Corps of Engineers, his personal charm led to his marriage in 1841 to Jesse Benton, a woman of considerable ambition and the daughter of the legendary Senator from Missouri, Thomas Hart Bent. Now politically well connected, Benton achieved fame and the title The Pathfinder, by leading settlers along with scout Kit Carson over the Oregon Trail. In the 1830’s Fremont had taken part in various topographical mapping expeditions into the West and this served him in good stead in determining the best routes for the pioneers. His exploits were steadily followed in the eastern papers, and Fremont became a national celebrity. During the Mexican War, Fremont played a major role in the conquest of California, although he displayed much energy but little military skill. After the war he served as military governor for California, and, after California was admitted to the Union, Fremont served briefly as a US Senator for the state. Well, I must say that whenever I have had involvement with government on the state or federal level, I have thought that a circus was surely running things! The sixth in my ongoing series examining the poetry of Rudyard Kipling. The other posts in the series may be read here, here , here , here and here. Something for the weekend. The Fall of Charleston sung by Tennessee Ernie Ford.